This custom bangle bracelet can be a great source of comfort and/or strength. Customize the plate with a word or short phrase that has special meaning to you. The price listed is for a bronze/bronze bracelet. If you change the metal combination the price will change. A simple source of inspiration or encouragement that can be worn everyday. 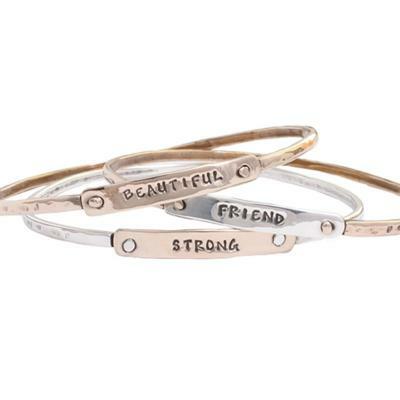 Our stackable bangle bracelets can be stamped with words to encourage you or a friend to be the best you can be. I purchased a silver and gold bangle with the word "Positivity" on it for my friend. Her son is going through cancer and this bracelet is a reminder to keep positive. She absolutely LOVED it! I was very impressed with the quality and craftsmanship and I plan on ordering more from Nelle & Lizzy. Their jewelry is so unique and special!! I gave this bracelet to my daughter-in-law for Christmas and we both loved it! Beautiful!